Corporate lobbying disclosure remains a top shareholder proposal topic for 2016. At least 66 investors have filed proposals at 50 companies asking for lobbying reports that include federal and state lobbying payments, payments to trade associations used for lobbying, and payments to any tax-exempt organization that writes and endorses model legislation. Political activity remains a top investor topic for the sixth consecutive year, with more than 90 proposals filed for 2016 that seek disclosure of either lobbying or political contributions. Reflecting investors’ interest in disclosure of corporate political spending, a rulemaking petition at the Securities and Exchange Commission (SEC) to require disclosure of corporate political spending has received a record level of support. More than 1.2 million comment letters have been submitted; the vast majority in support of the proposed rule. Moreover, according to a 2015 survey, a majority of public company board members believe that the SEC needs to develop mandatory lobbying disclosure rules for corporate political contributions. Still, the SEC has yet to act, and in December 2015 Congress passed the budget bill that included a rider that bars the SEC from issuing political spending disclosure rulemaking. Proponents believe that lobbying disclosure allows shareholders to evaluate whether lobbying is consistent with a company’s expressed goals and is in the best interests of the company and shareholders. Corporate reputation is an important component of shareholder value, and controversial lobbying activity can pose significant reputational risk. Take Action: If you own shares, please vote in favor of lobbying disclosure proposals. Do you invest in mutual or pension funds. Write to the administrator and ask them to support lobbying disclosure proposals. Additionally, although the SEC has already received over a million comments in support of a rulemaking petition to require disclosure of corporate political spending. For instructions, see my post Brent Fields to Track Support of SEC Petition on Political Spending. Undisclosed company payments to trade associations used for lobbying are a notable shortcoming in current reporting that allow companies to influence policy anonymously. Trade associations are not required to disclose their members or source of funds used for lobbying, and the amounts are substantial. For example, the U.S. Chamber of Commerce (“Chamber”) spent $208 million to lobby in 2014 and 2015, and over $1.2 billion on lobbying since 1998. Investors believe companies need to safeguard corporate reputations that may be affected by controversial political spending, including through third party involvement. For example, if a company takes steps to address climate change while simultaneously supporting trade groups that oppose legislative or regulatory efforts to limit its effects, then they are contributing to positions that run counter to company climate policy. Noting this contradiction, companies such as Apple and PG&E previously ended their membership in the Chamber because of its stance on climate change and opposition to EPA regulation. More recently, the Chamber has opposed the EPA Clean Power Plan rulemaking and sued the EPA. Chamber member companies with climate change policies that received resolutions include: AbbVie, Alphabet (formerly Google), American Express, AT&T, Bank of America, Citigroup, ConocoPhillips, Facebook, General Electric, IBM, Johnson & Johnson, Motorola Solutions, Travelers Companies, Verizon and UPS. CVS Health’s decision last July to end its membership in the Chamber over the organization’s efforts to lobby against anti-smoking laws in countries around the globe provides another case in point. CVS Health stated that the Chamber’s position on tobacco products is inconsistent with its business focus on health. Health care companies that are members of the Chamber and received shareholder proposals include AbbVie, Anthem, Johnson & Johnson and Pfizer. The proposals also continue to focus on reputational risks from involvement in the American Legislative Exchange Council (ALEC). ALEC is a tax-exempt organization that convenes state lawmakers and corporations to approve model legislation for passage at the state level. This legislation has included controversial bills on repealing state regulations on renewable energy, blocking paid sick leave, pre-empting minimum wage increases and opposing EPA regulation such as the Clean Power Plan. More than 105 companies have left ALEC in recent years, including 3M, BP, eBay, Facebook, Google, Microsoft, Shell, Visa and Yahoo. Prominent current ALEC members receiving 2016 proposals include: AT&T, Caterpillar, Chesapeake Energy, Chevron, Comcast, Devon Energy, Dominion Resources, Duke Energy, ExxonMobil, Honeywell, Nucor Corporation, Pfizer, Spectra Energy, Time Warner Cable, UPS and Verizon. Opponents of lobbying disclosure, which have included many of the largest trade associations, claim that disclosure is a form of silencing speech. Yet disclosure does not prohibit corporate lobbying in any way; it simply enables shareholders to evaluate whether lobbying is in the best interests of the company and shareholders. This is the sixth year proposals asking for lobbying disclosure have been filed by investors. In 2015, 65 proponents filed 54 proposals, out of which 33 went to a vote and averaged 26 percent support. The proposals have led many companies to improve their lobbying disclosure, including disclosure agreements at more than 40 companies. The investor coalition is comprised of public pension funds, labor funds, asset managers, individual investors, international investors, foundations and religious investors, many whom are members of the Interfaith Center for Corporate Responsibility. This initiative is coordinated and supported by AFSCME and Walden Asset Management, a division of Boston Trust & Investment Management Company. Whereas, we believe in full disclosure of our company’s direct and indirect lobbying activities and expenditures to assess whether our company’s lobbying is consistent with ExxonMobil’s expressed goals and in the best interests of shareholders. ExxonMobil’s membership in and payments to any tax-exempt organization that writes and endorses model legislation. As shareholders, we encourage transparency and accountability in ExxonMobil’s use of corporate funds to influence legislation and regulation. 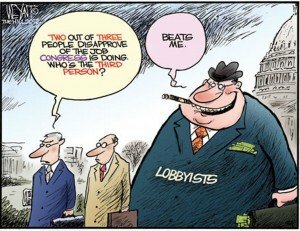 ExxonMobil spent $26.07 million in 2013 and 2014 on federal lobbying (opensecrets.org). These figures do not include lobbying expenditures to influence legislation in states, where ExxonMobil also lobbies but disclosure is uneven or absent. For example, ExxonMobil spent $699,362 on lobbying in California for 2014 (http://cal-access.ss.ca.gov/). ExxonMobil’s lobbying on climate change has attracted media attention (“Exxon Knew about Climate Change Decades Ago, Spent $30M to Discredit It,” Christian Science Monitor, Sep. 17, 2015). ExxonMobil is a member of the American Petroleum Institute, Business Roundtable and National Association of Manufacturers, which together spent over $65 million on lobbying for 2013 and 2014. ExxonMobil is also a member of the Western States Petroleum Association, which spent $13,553,942 on lobbying in California for 2013 and 2014. ExxonMobil does not disclose its memberships in, or payments to, trade associations, or the portions of such amounts used for lobbying. Transparent reporting would reveal whether company assets are being used for objectives contrary to ExxonMobil’s long-term interests. And ExxonMobil does not disclose membership in or contributions to tax-exempt organizations that write and endorse model legislation, such as being a member of the American Legislative Exchange Council (ALEC). ExxonMobil’s ALEC membership has drawn press scrutiny (“ExxonMobil Gave Millions to Climate-Denying Lawmakers despite Pledge,” The Guardian, Jul. 15, 2015). More than 100 companies have publicly left ALEC, including BP, ConocoPhillips, Occidental Petroleum and Shell. “The 2015 BDO Board Survey,” BDO, October 2015, p. 4. Dave Levinthal, “Trade Groups to Top Corporations: Resist Political Disclosure,” The Center for Public Integrity, January 27, 2016. A corporation may ask its employees to contribute to a corporate PAC. A corporation may now communicate with all employees about candidates, including encouraging them to vote for or against particular candidates. Requiring employees to participate in company-sponsored political activities remains risky. Threatening job security, discipline or termination for political activity may present significant risk under state law.